According to an 1860 handwritten label in its former display case, this iron kettle or cauldron belonged to the Wampanoag grand sachem Philip (or Metacom, c. 1639–1676). It was probably used for cooking over an open fire in his camp. The Wampanoag traded food and other natural resources with the English for durable kettles that replaced more fragile pottery vessels. 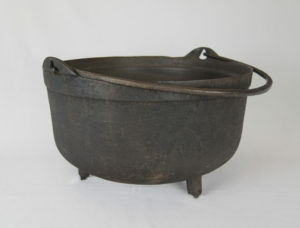 This kettle was taken as booty by Captain Benjamin Church (c. 1639–1718) early in the bloody conflict that came to be known as King Philip’s War (1675–1678) after Church and his men invaded Philip’s Mount Hope homeland. Church later became the Puritan hero of the conflict when in August 1676 he led the group that captured and killed King Philip, effectively ending the war. Church, who reached the rank of colonel, kept the kettle as a trophy during his life. After his death in 1718, some of Church’s personal property was sold at auction, where Philip Wheeler of Rehoboth bought the kettle. He gave it to his daughter Martha, who married Sylvanus Martin of Rehoboth. She gave the kettle to her daughter, also named Martha, upon her marriage to Colonel Christopher Blanding of Rehoboth. Martha Blanding died at age 95, bequeathing the kettle to her son. He bore the surname of each of his ancestors who had owned the kettle—Wheeler Martin Blanding.